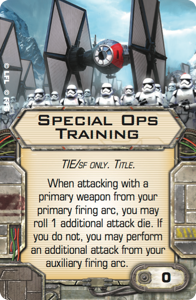 Due to my extremely limited knowledge of the X-Wing game at the moment this is taken from fantasy flight games website. Designed for atmospheric combat and defense, the TIE Striker was a streamlined version of the standard TIE line of starfighters that featured advanced high-speed wings and the increased firepower afforded by an extra pair of laser cannons. The TIE Striker makes its theatrical debut this December in Rogue One, but it makes its X-Wing™debut before then. The TIE Striker Expansion Pack is due to arrive at retailers ahead of the movie’s December release, and you can expect to find plenty of Star Wars fans looking for ways to use the ship to enhance their Imperial defenses. 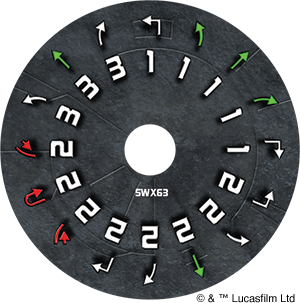 As many X-Wing veterans have noted, Waves IX and X have made liberal use of the Title upgrade type. 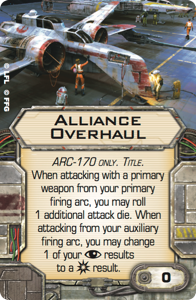 Wave IX saw the non-unique Alliance Overhaul Titlefor the ARC-170 and the non-unique Special Ops Training Title for the TIE/sf. 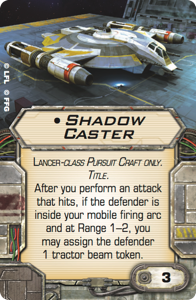 The Shadow CasterExpansion Pack came with a unique Title upgrade, the namesake Shadow Caster , and we’ve already seen the Sabine’s Masterpiece , Kylo Ren’s Shuttle , and Pivot Wing Title upgrades scheduled to accompany the ships from Wave X. 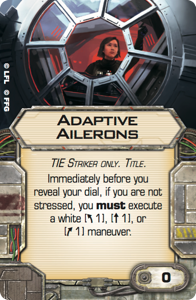 And as we’ve already noted in the article Go Rogue, the TIE Striker Expansion Pack adds another Titleupgrade to this mix— Adaptive Ailerons . Adaptive Ailerons impacts how you fly your TIE Striker because it literally forces you to take the equivalent of a boost action immediately before your unstressed pilot executes a maneuver. 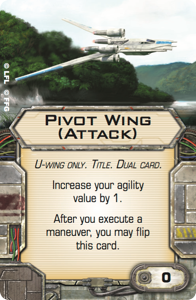 This can be good if your pilot has a high enough pilot skill to react to your opponent’s maneuvers. But it can also be challenging if you want to twist and turn in the confines of a tightly clustered battlefield late in the game. 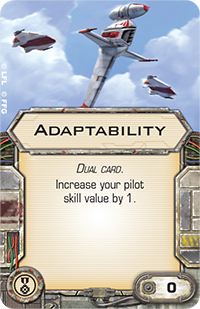 Accordingly, as much as Adaptive Ailerons affords your TIE Striker an entirely unique playstyle, it’s also a free upgrade that you may wish to leave aside at certain times and within certain squads. After all, even without Adaptive Ailerons, the TIE Striker has an impressively flexible maneuver dial ; it’s just not anywhere so fast or adaptable as it is when your ship is equipped with the Title. Of course, this is where the ship’s top ace comes into play. At a pilot skill value of “8,” “Duchess”offers a nearly perfect blend of high pilot skill and unique pilot ability. Her high pilot skill value allows her to react to the final positions of nearly ever other fighter, especially when she’s equipped with Adaptability or Veteran Instincts, meaning that her Adaptive Ailerons offer tremendous repositional value, allowing her to end up exactly where she wants—as in the diagram above. However, since there are times you might prefer not to have “Duchess” race forward at speed “1” before executing her maneuver, you can allow her to ignore the ability of her Adaptive Ailerons. Effectively, she can execute her maneuver, then, from any of four different positions, rather than from three different positions, and she can better react to fighters that buzz about her in close quarters. Of course, there’s more to the TIE Striker than its Adaptive Ailerons. 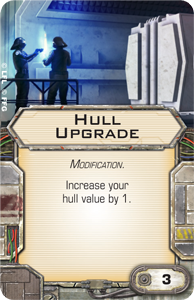 It partners an aggressive primary attack value of “3” to a hull value of “4,” and though its agility value of “2” is lower than that of many other TIE variants, you can effectively raise its agility with the new TIE only modification,Lightweight Frame . By keeping your TIE Striker lean and nimble, Lightweight Frame increases its odds of evading the game’s deadliest attacks. Whenever you’re defending, if you rolled fewer defense dice than the attacker’s attack dice, you can roll an additional defense die. 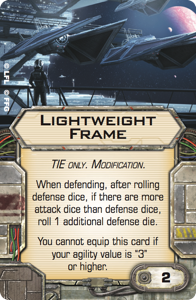 So while you won’t need—or benefit from—your Lightweight Frame when you’re deftly avoiding an X-wing’s shots at Range “3,” it may help you evade that same X-wing’s shots once you close into Range “2” and have to match your two agility against its three attack dice. Then you have the ship’s pilots. 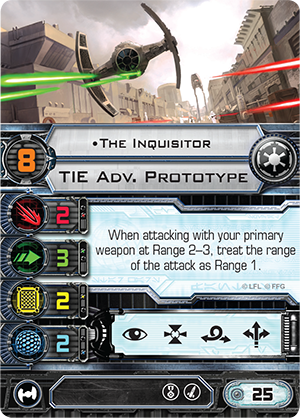 The TIE Striker Expansion Pack comes with a total of six ship cards, of which three are non-unique, and the three unique aces each suggest a dramatically different way to fly your TIE Striker. 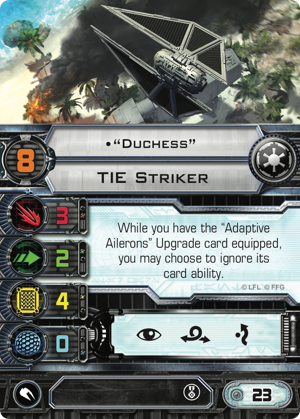 We’ve already seen “Duchess” and explored how her high pilot skill value and her ability to ignore the text of her Adaptive Ailerons may make her one of the game’s better arc dodgers, able to line up shots against her foes, even while she ducks out of their firing arcs. At a pilot skill value of “5,” “Countdown” may be the most reliably survivable starfighter pilot in the Empire. So long as he remains unstressed during the Compare Results step of combat, “Countdown” can take a stress to cancel all dice results, suffer one single point of damage, and take a single point of stress. 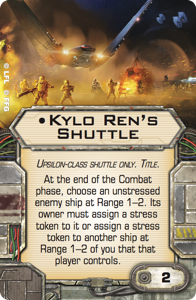 In other words, if you can clear his stress each round, “Countdown” can do the unthinkable; he can go toe-to-toe with a ship as large and powerful as the Millennium Falcon or the Ghost for as many as four rounds and still count a point of hull from his Hull Upgrade . 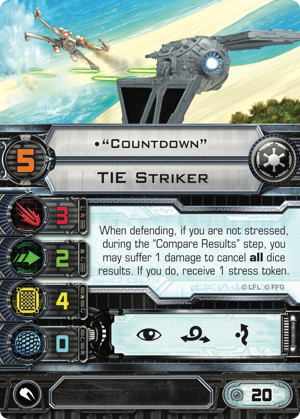 Meanwhile, while “Countdown” is the expansion’s purest defender, “Pure Sabacc” is its most aggressive pilot. 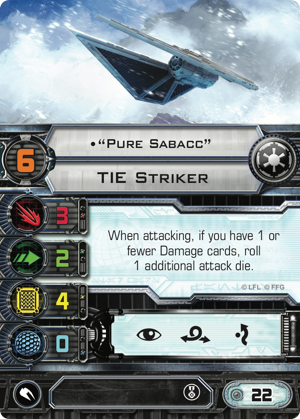 So long as “Pure Sabacc” has zero or one damage cards, he rolls an extra attack die. Period. 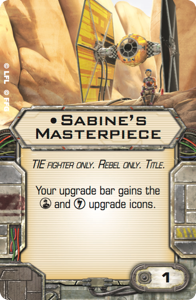 This means that in your opening round or rounds, “Pure Sabacc” poses a four-dice primary attack threat for a mere twenty-two squad points. 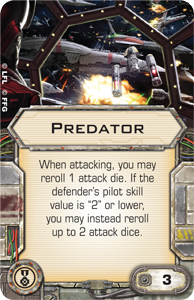 You can increase this attack threat, too, by equipping an elite pilot talent like Predator orSwarm Leader . 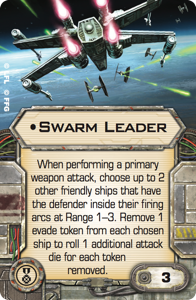 New to the TIE Striker Expansion Pack, Swarm Leader offers a unique approach to the TIE swarm archetype, and it’s one that suits the TIE Striker better than many of the typical “distance 1” requirements of other TIE swarms. 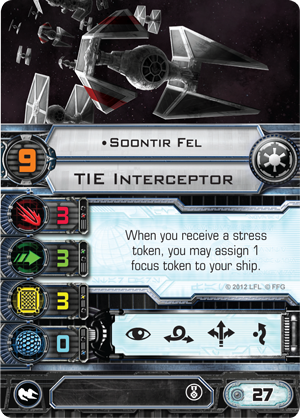 With its powerful lasers, its Adaptive Ailerons, and its talented pilots, the TIE Striker is a potent addition to the Empire’s fleet, and it’s capable of playing a good range of roles within your X-Wingsquadrons. How will you use the TIE Striker? Options abound. 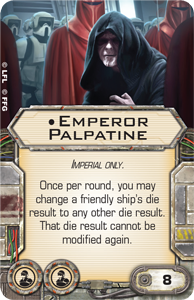 You might fly “Duchess” along with the Inquisitoror Soontir Fel and Emperor Palpatine’s Lambda-class shuttle. 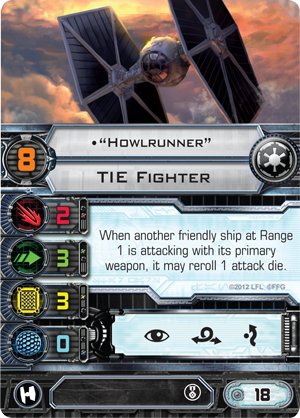 You might fly a swarm of Imperial Trainees with “Howlrunner.” You might use “Countdown” as a resilient flanker. 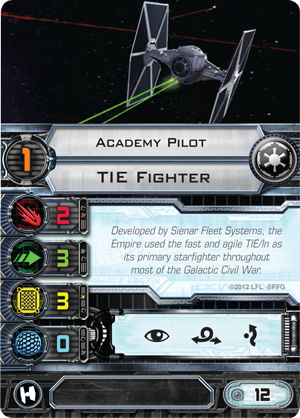 Or you might blend a few TIE Striker aces into a squadron with “Howlrunner” and an Academy Pilot in order to force your opponent into some hard decisions, such as in the squadron below. By mixing a defender as tough as “Countdown” with some lethal attackers and a strong late-game arc-dodger, this squad plays against your opponent’s ability to prioritize his or her shots. Will he attack “Howlrunner,” who offers free rerolls to all her squadmates attacking from within Range “1” of her? Will he go after “Pure Sabacc,” to minimize the potential for six– or seven–die attacks? Even if you hold him back at Range “3” while your Academy Pilot is blocking and denying actions? Or will he try to pin down “Duchess” before you wear his squad down to a single ship, and “Duchess” is able to get the better of the one-against-one dogfight by slipping out of every shot he tries to line up? A squad like this ensures that there’s no single “right” answer, and without a clear priority target, your opponent may not begin the engagement with a strategy as focused as your own. With its solid stat lines, the flexibility and speed afforded by its Adaptive Ailerons, and the incredible talents of its unique aces, the TIE Striker is a powerful addition to your Imperial fleet. How will you fly it? Which ships will you fly with it? Share your thoughts with the other members of our community forums. Then head to your local retailer to pre-order your copy today. Rogue One is coming soon, and the TIE Striker Expansion Pack is coming even sooner! 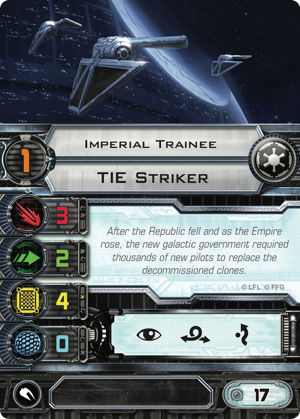 I must admit that even though I am playing rebels at the moment (Millenium Falcon for the win) I am looking at the Tie Stiker and thinking that an Imperial set might be quite nice and would fit in well with the slimming down of games that is planned for 2017!